With all it’s might and glory, there are still certain aspects of the Grand Canyon that continue to puzzle scientists and are unknown to many visitors. Here are three things you might not know about the Grand Canyon. Only accessible by helicopter or horse on trail, the Native American tribe of the Havasupai Indians have made a home out of the Grand Canyon. If you’re curious about how they live, you can book a trip to visit and stay there to learn more about these isolated individuals that live in this natural wonder. While the beauty of nature is all around you when stepping this gorgeous park, there are also man-made structures that still exist within the Canyon walls itself including a railway depot, a watchtower from 1932 and a cabin that was built in the late 1800’s. If you want to see these structures and know more about their history, book one of the many Las Vegas to Grand Canyon tours available. While it still remains a mystery to this day how the Grand Canyon was formed, ongoing research puts the age of the canyon at 5 to 6 million years old. 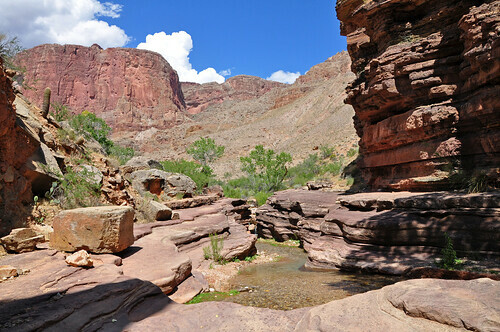 One formation theory is that the Colorado River broke away and formed the structure over millions of years.